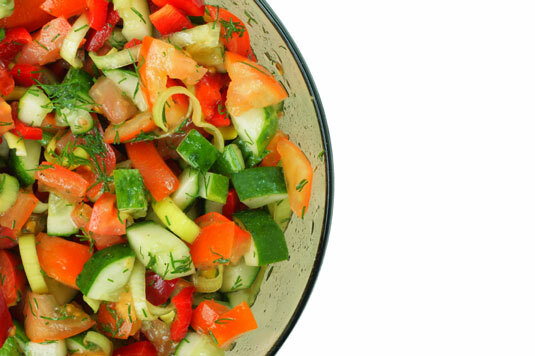 This salad is a big hit at potluck dinners — just double the recipe and serve the dressing on the side. No one will even notice that it’s Paleo. Place tahini sauce, lemon juice, water, and garlic in a food processor. Blend until smooth, taste, and season with salt and pepper. Set aside. Place the minced parsley in a large bowl. Dice all the vegetables into 1/4-inch cubes and add to the parsley. Slice the olives and add to the bowl. Drizzle olive oil over the vegetables, season with salt and pepper, and toss until coated. Pile vegetables on individual salad plates and drizzle with 2 tablespoons of the tahini dressing. Store leftover salad and tahini dressing in the refrigerator, covered, for up to three days. Per serving: Calories 166 (From Fat 103); Fat 11g (Saturated 1g); Cholesterol 0mg; Sodium 267mg; Carbohydrate 15g; Dietary Fiber 3g; Protein 4g.